David has charted the society from its very beginning, and also through the years of George Fullelove. Along the way, railway expert and chorister Ian Pell also turned up some great material. This is all part of a complex and surprising musical culture in Brownhills, both in the classical tradition and the more modern sense. The final article in the series has now been completed, and I present it here, with great thanks to David for putting so much work into it, but also to Douglas Birch MBE, Deryck Langford and all the other people David has interviewed in the the course of his extensive research. It really is wonderful to be able to share this material here on the blog. If you have anything to add, please don’t hesitate to comment, or mail me: BrownhillsBob at Googlemail dot com. Cheers. Brownhills Co-operative choral society . The latter years. 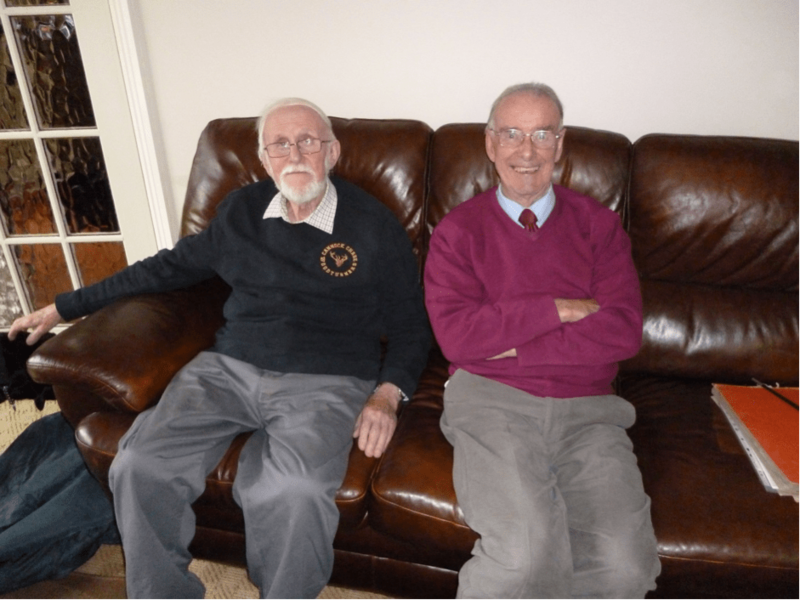 Conversations with Messrs Douglas Birch MBE and Deryck Langford. Brownhills Co-operative Choral Society stands as one of the local community’s great achievements in the years from its formation in the 1940s until its demise, over 50 years later. Throughout my research I have been greatly helped by the overwhelming kindness and generosity of past choral members and in this third article I hope to share some of my thoughts and impressions here. Firstly, sponsorship and its importance. In Brownhills we see how the National Co-operative Society, through their Education department, were the main sponsors for this local choral society. The minutes and records show how important this ongoing commitment was, in funding the purchase of music, underwriting the hiring of concert venues, the hiring of orchestras, pianists, soloists, and in organising Music Competitions and events throughout the Co-operative Society where choirs competed and gained experience as well as success. Secondly. The importance of the local choral society’s discussion and debate, fully recorded in the minute-book, where Brownhills Choral Society took the decision to ‘aspire to greater heights’, and to enter the prestigious Llangollen International Eisteddfod. This gave the choir a target and a focus for their rehearsals, and a new commitment and discipline to the group. This also brought a new public image and increasing confidence to the choir. The choice of concert programmes, venues, and the number of concerts as well as the festivals and successes in various competitions followed on from this initial decision. Thirdly, some important central figures and personalities emerged from the research, and from the discussions with a few of the members. With the loss of the society’s founder George Fullelove in the 1950s, the choral were fortunate to have on hand their ‘replacement’ conductor who was to become the driving force and key inspirational person for the choir, Mr. Deryck Langford. The choice of concert programmes, the balance of pieces selected, and the suitability to the voices in the choir are all self-evident in the many souvenir programmes I have seen, and in minute-book records, and personal scrapbooks. Fourthly, an important singing teacher who helped ‘train the soloists to another level’ (Mr.Douglas Birch MBE) was Arthur Langford. He had been a member of the British Forces Network, and was stationed in Germany in the late 1940s, from where he had gone to further his classical musical career in the BBC. 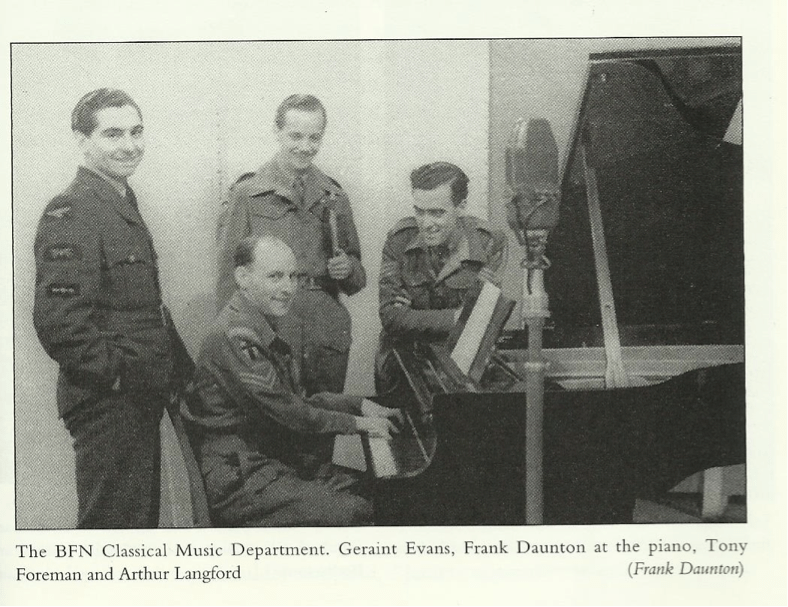 The book, ‘This is the British Forces network’ by Alan Grace gives a brief history of some of Arthur’s work in the Classical Music department of the British Forces Network. The person pictured on the left of this photo, attending this audition, went on after this ‘initial encouragement’ to become very successful. He was Sir Geraint Evans.. Image supplied by David Evans. The Brownhills choral soloists and choir were very fortunate to have the help and input of Arthur Langford to complement that given by Deryck, his conductor brother. 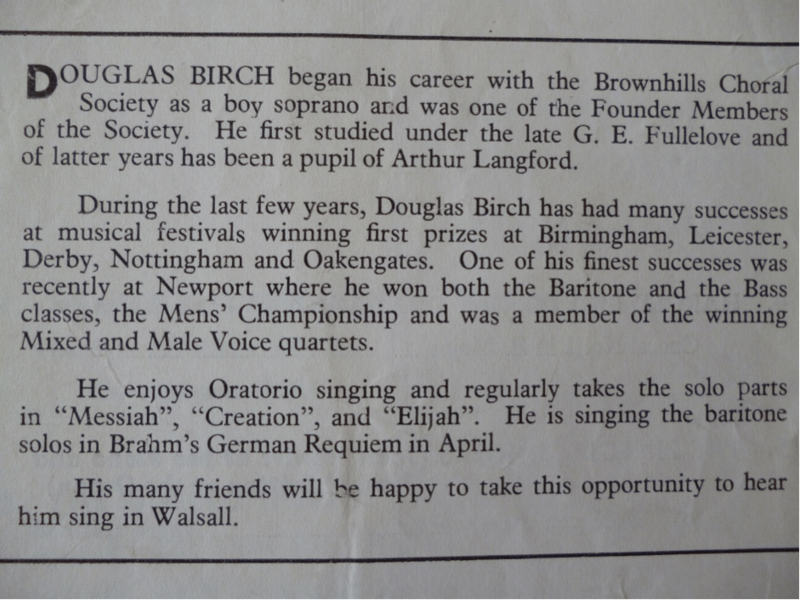 from a concert programme notes of that era which gives a resume of Mr.Douglas Birch , one of the Brownhills Choral Society’s soloists. Image supplied by David Evans. It was at this International Eisteddfod in 1974 that Douglas Birch gained first prize, and Rhyllis Cooper also gained first prize in the solo mezzo soprano voice category. This scrapbook cutting, from a concert programme notes of that era which illustrates the calibre of the performers. Click for a larger version. One surprising choral event in the 1980s was a 12 hour marathon choral concert, which took place in March 1986, starting at 8:30am and going on until well after 8:30pm. The photos taken during this amazing event show soloists, detail the pieces they sang, the indefatigable Deryck Langford conducting, the choir singing, and singing, and singing. The material even records the conductor’s inimitable comment at the end of the marathon, ‘well choir, that was a cracking rehearsal, I mean concert’ – that was pure Deryck! The choral society’s membership had risen to a high of 72 or so in 1971, but had seen a steady decline until in 1991 it stood at 41. The choral had performed huge, demanding oratorios, Messiah, Creation and Elijah, at their height, but by the the mid 1990s, times had changed, and the choral and the Co-operative Society parted company, quite amicably. The ‘Brownhills Co-operative Choral Society’ then became ‘Brownhills Choral Society’ with its new, equally comprehensive constitution. In the course of conversations with Mr.Douglas Birch, one question brought a smile and a simple reply. The minutes recorded the wish that the society would continue at least until its 50th birthday, in 1999. I am sure that there will be treasured scrapbooks, photos, souvenir programmes, concert tickets, even a copy or two of the choral society singing some of their ‘pieces’ in the rich, pure, lilting tones that made ‘the choral’ special. Very special. In 1979, the Choral Society even released a record – I spotted this on eBay a few months ago. I extend my personal thanks to Mr. Douglas Birch MBE, Mr. Deryck Langford, Mr. Bob Watson, Mr. Mike Smith and others who have patiently talked to me, and provided so much material, information, encouragement end assistance. Sometimes, usually in the afternoon, a casual walker along the pleasant canalside towpath in Brownhills might hear the delicate sound of sweet vocal music, carried by the breeze from a nearby church. It is the ‘Wednesday Choir’ singing. Their conductor? Deryck Langford. This entry was posted in Brownhills stuff, Churches, Events, Followups, Fun stuff to see and do, Interesting photos, Local History, Local media, Local music, News, Reader enquiries, Shared media, Shared memories, Social Media, Spotted whilst browsing the web, Walsall community, Walsall Wood stuff and tagged Birch, Brownhills, Brownhills Choral Society, Brownhills local history, choir, Choral, co-op, Co-operative, David Evans, Deryck, dog, Douglas, Eisteddfod, George Fullelove, Langford, Llangollen, Local History, Marathon, MBE, New Photos, Silver Street Methodist Church, Staffordshire, Things to do, Walsall Wood. Bookmark the permalink. Thank you, David Evans, for this brilliant little series on the Brownhills Co-operative Choral Society. so much hard work and research behind the scenes, but the finished article, perfect ! I still remember, with nostalgia, the Walsall Town Hall presentations in which the choir accompanied the best singers in the land, showing every right, by the glorious sound filling the hall. to be sharing the same platform with the very best. It seemed to me, at the time, that the outstanding merit of the choir, brought out the very best in the visiting soloists. ‘music never leaves you’ ? Absolutely right ! And you for your kind words….the quality of the presentation is a tribute to the wonderful backstage skill and hours of collating, assembling, editing etc…that is “Bob” and which makes blog exceptional and in a class all of its own. Doug sang at my uncle Alan’s funeral (1996). Reading that he won prizes as baritone and even bass was a surprise. Doug sang, acapella, with a clear, plain (this is praise, not criticism) tenor voice that was captivating and moving. A pity that many of today’s popular “singers” fall such a long way short. Anyway, thanks for this series … it’s been very interesting and helpful in working out what exactly I’d found in the Welsh Air Ambulance shop! !